PCOO Undersecretary Lorraine Badoy refuted the claims coming from Mocha Uson’s camp that she, together with Secretary Martin Andanar and Director Harold Clavite are instrumental in the decision of Uson to resign from the PCOO. Usec Badoy shared a lengthy post on Facebook explaining her thoughts on the controversial resignation of the popular Asec. Mocha Uson from the PCOO. She bared that Uson doesn’t really need to resign before the congress would release the budget for the PCOO. All she needed to do was to submit herself and answer the queries from the congressmen. 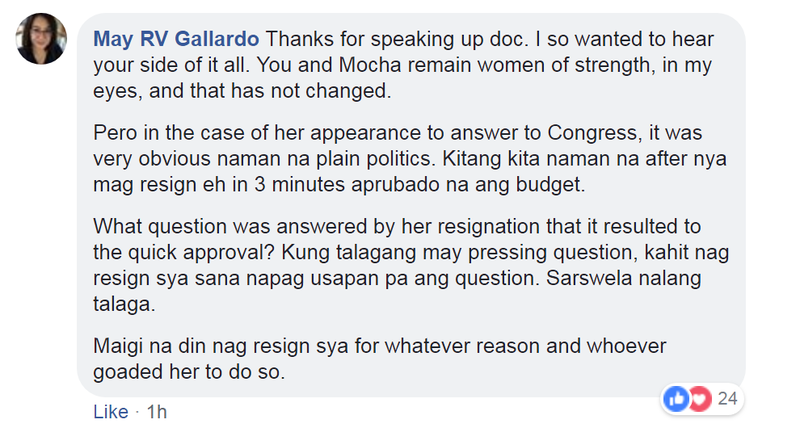 The congress has the right to ask, and the PCOO has the obligation to answer. Badoy explained that it is not even Uson who will personally answer the questions, because they a sponsor in Congressman Olivarez who will be answering the questions for them. The PCOO Usec also revealed that what caused the downfall of Mocha Uson is her wrong choice of people to surround her. Uson is good at heart, but the people around her is another matter. Badoy claims that the people surrounding Uson are incompetent people with questionable qualifications. They have no principles, and think so highly of themselves. The so-called friends of Mocha are really opportunists who see Uson as their ticket to be closer to the president. People who use the Asec for their own selfish agenda even at the expense of Mocha, and the unfortunate thing? Mocha is too blind to see it coming. Her friendship with Drew Olivar was a clear example of her friends damaging her reputation. Olivar’s insensitive comments against disabled people drew the ire of even the most loyal Mocha supporters. But instead of distancing herself to Olivar, she chose to defend him. In the end of her lengthy post she gave Mocha Uson some sound advice, an advice not coming from an enemy, but from someone who cares and want the best for Mocha.